I’ll leave the detailed post-ride deliberations to the end – I have boringly categorised them for easy skipping of sections. When I signed up for the Not Quite the Spurn Head 400 I had the choice between two rides, both starting in Sowerby Bridge, and organised by Chris Crossland – the last 400 I did was the Old 240, so I opted for the flatter one. At the start Chris joked that it was a choice between hills and wind – having studied the weather forecast I did wonder whether I had made a mistaken choice. Sadly, this ride doesn’t finish at the end of the point any more, but at the Kilnsea visitor centre, due to coastal erosion: Spurn is one of the oddest and most beautiful places in Britain, and home to many rare birds. Interestingly, according to some sources the road is open – others closed. 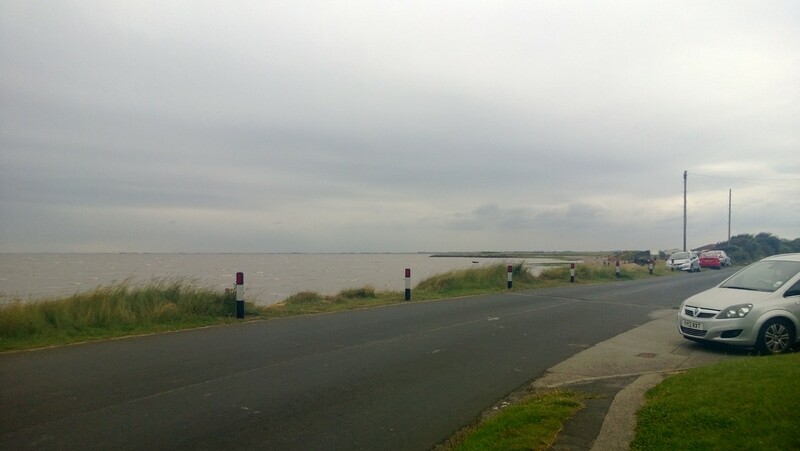 The Kilnsea bend just before the centre gives a sudden and surprising view of the Humber Estuary. Despite the road to Spurn being very close to the North Sea and the Estuary the sea is invisible until this point, although my Garmin provided an entertaining picture of its proximity. This spot is much frequented by sea fishing folk, and is the last stop for dog owners – the point itself is dog-free. My experience of this ride was slightly diminished by my poor ability to follow a reasonably clear route sheet, and a variety of electrical failures (see below); apart from this and some contact point anguish (too much information below) the ride was quite unbelievably magical. Some of the best moments of the ride, apart from reaching Spurn, were on the Old Goole Road (A161) in the night, with no street lights. After Crowle (I arrived just after pub closing time to hoots of drunkenness) I was passed by just a single car in what seemed like ages, on relatively good road surface in the most desolate of farm land. Indeed there is something about travelling through this predominantly agricultural part of England that is rather special: at one point I was in between two wheat fields with no hedges on a narrow road. I was also harassed by chaff from a working combine harvester. The best bit, however, was arriving at the Woolley Motorway Services, and realising after a very challenging night that I was well within the time limit (by that time my Garmin was on the blink and I hadn’t dared look at the control times on my brevet card). I had spent the previous hours unsure I was following the route and fairly convinced I would run out of time. In the end I just made the final control in Sowerby Bridge to be treated to soup and tea. Although I was last, two DNFed, so I did not feel too bad about my performance, given my issues in the night (see below). Actually, not the best: the roads at the far East of the ride all seemed to have signs to the mysterious Hornsea, location for three years of family holidays (and one visit when my partner was pregnant with our older child). I spent much of the ride reminiscing about our visits and missing my family, who were away and not due back until the Monday afternoon. Rather than a blow-by-blow account, here are some categorised thoughts, descriptions and memories. Apart from assorted road kill I spotted or heard all sorts of wildlife, especially during the night. At one point I had to dodge cows in the road, and I saw many rabbits. Most exciting of all, a stoat ran across the road in front of me in the strobe-illuminated pitch black (after my front light had failed), a light streak. As usual for a night ride the sound of unidentified birds and larger creatures in the hedges and ditches would occasionally distract me. I passed prisons, a refinery, and mysterious signs to an underground bunker. The route went under and over the M62 Motorway, and passed both the old and new of electricity generation: at one extreme I passed as close to one of the Ferrybridge power stations as I am likely to in a while; at the other I was surprised to find the recently built Out Newton Wind Farm: the turbines have been named Jess, Laura, Jenny, Liam, Callie, Chris and Faith after children in a local school. Control number one provided me with a warm welcome and a very large cheese roll cut into quarters and individually wrapped! I was struggling with a headache when I reached North Cave, and rather unable to communicate with the other tail-ender I encountered (sorry). The wonderful service and almond biscuits (icing sugar all over my right brake hood) really sorted me out. A clean and pleasant café: incredibly quick service. I charged my Garmin from my Power Monkey and ate poached eggs and toast, which were excellently and quickly cooked. This was the only real sit down off the bike I had. I bought flavoured milk and a sandwich here, and felt very cold (despite a friendly welcome): I normally like service station controls though as I can buy what I need to eat and get off quickly if necessary, but here I could have done with a sit down, so probably should have gone over the way to the dread MacDonald’s. Never have I felt so pleased to arrive at a control, after my navigation problems. Bought a sandwich which I half ate, but felt a bit sick. Could have sat down, but in a bit of a state, so decided to just push on to finish. There was a near tail wind out, and a cross or head wind back – three or four very heavy showers and some lighter rain. Given the dodgy weather forecast we were very lucky. My rear lights worked perfectly, combination of leds and a fibre flare. My front emergency lights worked fine too (a Lezyne and a Knog) and I used a weedy head lamp to illuminate the route sheet. My Lumicycle front light with a single 5W halogen was a bit dimmer than comfortable, but was sufficient in the sections without street lights… until it abruptly cut out whilst I was puzzling over my post-diversion route. It should have given me a full 12 hours of light, but it ran dry after about 4, so obviously something is amiss with the battery, which I hadn’t used for a while. The rest of the night was completed using very inadequate lights, cutting my speed in half and adding to my time problems. It also made the experience a little like the final strobe-illuminated scenes of Alien: my Knog on strobe actually allowed quite good illumination of the periphery, but was a fairly freaky touch. I rode my new Merida, which performed beautifully. The lack of mudguards didn’t bother me or anyone else, and it felt very natural and easy to control. I have been vacillating between saddles this year, and had recently bought an SLR, which seemed to suit me very well. I have also been trialling a Romin, which although a bit wide in the nose, avoids perineal distress. Sadly, I overtightened the clamp on the SLR (distorting the rails), and I decided not to use the Romin as it places a lot of pressure on the sit bones. I have been using an old Arione recently and it has seemed OK, but was a real mistake on this ride. I was numb in the groin during much of the second half of the ride, and as I write this I still have numbness four days after the ride (although sensation is returning). Back to the Romin next time, I would rather have sore sit bones! My Bont shoes were fantastic, just a little bit of pain in my right foot towards the end of the ride. For some reason my right hand is still suffering numbness (left is fine): something posturally odd there, but again sensation returns gradually. I didn’t have a route file, so decided to use the standard technique – route sheet and stupidity. I normally manage to lose my way at least once just by missing turns or misinterpreting instructions, but in normal circumstances it adds little time to the ride. I also had a Garmin 800, which proved very useful in confirming my position relative to the instructions and a Nokia WP8, which ended up very useful (the built in navigational software is really slick). I was OK after few mistakes until I reached a closed road and diversion on the route near Moss, and became disorientated. At this point my front light and Garmin both failed within a few minutes (very x-files) and I resorted to my Nokia, which safely delivered me to Woolley Services. I don’t know how much time I lost, but I nearly panicked: I decided to be calm, and just do my best. I would guess the lack of proper front lighting and route uncertainty lost me around two hours! This ride was x-rated which means that all the controls were services or cafes where I obtained the required stamp/sticker/receipt. The start was just outside the market on Sowerby Bridge (a funny sight at 0530, much like a scene from Close Encounters); the finish the organiser’s house. Fantastic job by Chris Crossland, who simultaneously ran the Old 240 the same night. Much of the route was very flat, but the beginning and end of the ride included some pretty tough climbs, and I was glad I had a relatively light bike and load. The only part I hated was Kingston where I failed to count roundabouts and ended up a bit sad and confused and had to use my Garmin to get back on track. Everything else, whether industrial or rural was a pleasure, and the traffic was actually OK, and most drivers fairly well-behaved (even the late-night boy racers). I ate a combination of cheese and tuna sandwiches (bought en route) drank plain water and isotonic drink: gels and energy bars made up the remainder of my input (Torq remain a firm favourite). My only hot meal was poached eggs, and the only caffeine a cup of tea (Kilnsea) and a machine coffee (Leven). I never felt close to bonking (see contact points, above). 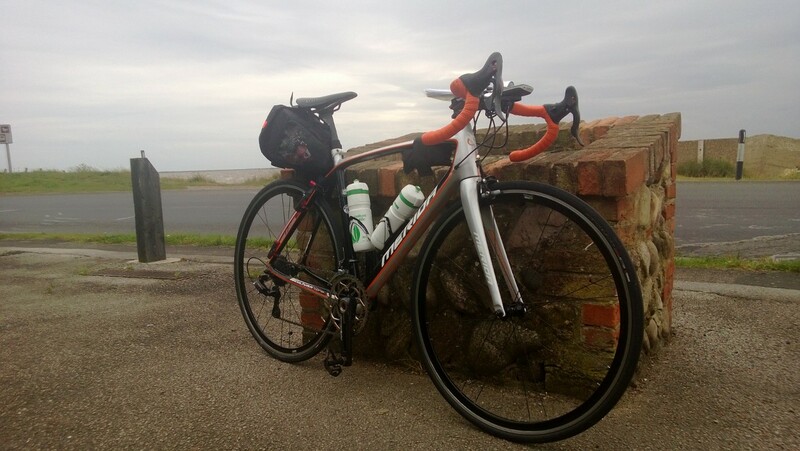 This entry was posted in audax, cycling, equipment, injuries, mapping, randonneur, ride reports by spandelles. Bookmark the permalink.